John Cena on Nikki Bella: "I Love Her and I Miss Her"
John Cena seems to be doing well, all things considered. 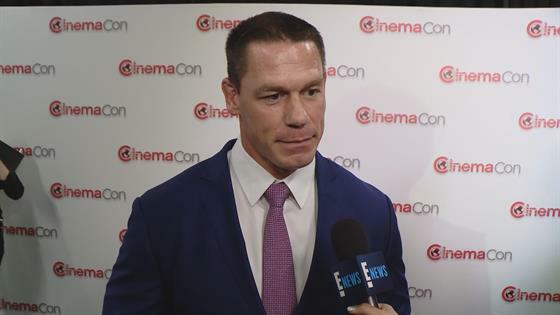 While promoting Paramount Pictures' Bumblebee at CinemaCon in Las Vegas Wednesday, Cena gave E! News an update on how he's been doing since calling off his wedding to Nikki Bella. The couple called it quits in mid-April and the exes would have been tying the knot in Mexico May 5. Citing Walt Whitman's "O Me! O Life!," he said, "'The powerful play goes on and you get to contribute a verse.' I love that Wittman quote. Life is sometimes tough, but it's life and it goes on." Though the decision to end their engagement was difficult, Cena explained, "Nicole knows I love her and I miss her, but that is what it is. And I'm still here, still going—and I choose to go." Admitting that "the amount of heartbreak" is hard to "conceptualize," he added, "When you love somebody, it stings. That's why musicians write about it. That's why poets write about it." And he knows he's not alone in feeling that way. "If anything, just try to take away what went wrong," he advised E! News, "and enjoy the good times you had with the person that you love." Nikki resurfaced over the weekend at Nirvana Food & Wine's Rosé Parté—without her engagement ring. The last time she'd been seen with the 4.5 carat diamond sparkler was Apr. 3. A rep for the former couple confirmed their breakup to E! News Apr. 15, saying, "After much contemplation and six years of being together Nikki Bella and John Cena announced today their decision to separate as a couple." The wrestlers also released a joint statement about the split. "While this decision was a difficult one, we continue to have a great deal of love and respect for one another," the stars said. "We ask that you respect our privacy during this time in our lives." For now, Cena is focused on promoting Bumblebee, in theaters Dec. 21.